When it comes to feeding time, betta have been accused of being both ‘too picky’ and wanting to eat everything in sight. So, what do betta fish eat? And how are you meant to satisfy their sometimes ferocious appetites? How often do you feed a betta fish? And how much at each meal time? There are a bewildering array of different fish foods available, as well as often contradictory advice doled out that leads to making the right decision for feeding betta fish something of a challenge. So in this article, we’re going to clear things up and answer all the feeding questions you could possibly have. The first thing you should do when deciding what to feed a betta, is to look at the problem through their eyes: What do they like to eat and what would they eat in the wild? They’re Not Wild, So What Do Betta Fish Eat In Home Aquariums? What Are Good Foods For Betta Fish? How Much To Feed a Betta Fish at Each Meal? How Long Can a Betta Fish Go Without Food? Why the ‘Betta-In-a-Jar’ Living off Nothing But a Peace Lily is Nonsense! To understand what betta fish eat in their natural environment, you must first understand where they originate from, which is rice paddies, small streams and shallow drainage ditches in parts of Asia such as Thailand, Cambodia, Malaysia and Vietnam. As a result of their environment, food choices are sometimes limited and they will eat whatever they can find, leading to a slightly omnivorous diet of both meat and vegetation. However, for much of the year, there is a plentiful supply of flying insects, their eggs, and larvae that use the bettas habitat, the same bodies of water, for eating and breeding themselves. So betta have evolved to be mostly carnivorous and require a high protein diet. A wild betta’s diet will mostly consist of a variety of different worms, flying insects (midges, mosquitos), their larvae and the occasional smaller fish. Your betta fish might be far from their natural environment now, but there’s no reason why you can’t feed them the food they’ll enjoy and benefit from the most. This means trying to feed what they would have in the wild, the foods we’ve just described above. Below are two lists of both good foods to feed a betta, and ones we advise to avoid’, where we discuss the pros and cons of each and what makes them good or bad. This will help you decide which food options are best for your little buddies. As the name suggests, this is food that once was live but is now frozen to preserve and make it easier to stock, sell and serve. 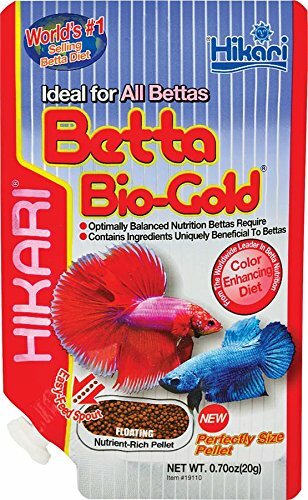 Closest to a Betta’s natural diet without actually feeding live food – They love it! It’s a lot easier and cleaner to store and handle than unfrozen live food. Being frozen, it keeps fresh for longer than live. As it’s frozen, a high percentage of bacteria (but not all) is killed. Being natural, it’s less likely to lead to digestive problems when compared to any processed food. It’s more expensive than many other food options. We believe this to be the best food for betta fish, all things considered and weighing up the risks against the benefits. If you do not make it a staple, at least try to work some into their diet now and then. Just add some preventative ick treatment at the same time, to be on the safe side. Another highly natural food with minimal processing that closely resembles what a betta will have eaten if wild. They love and thrive on it. Thankfully all bacteria and parasites are killed in the freeze-drying process so it will never introduce disease into your aquarium. As a natural product with minimal processing, it’s far less likely to cause digestive problems than some other foods. Some seem to refuse eating freeze dried worms, though will happily eat freeze dried brine shrimp. Can be quite expensive to purchase compared to some other foods. 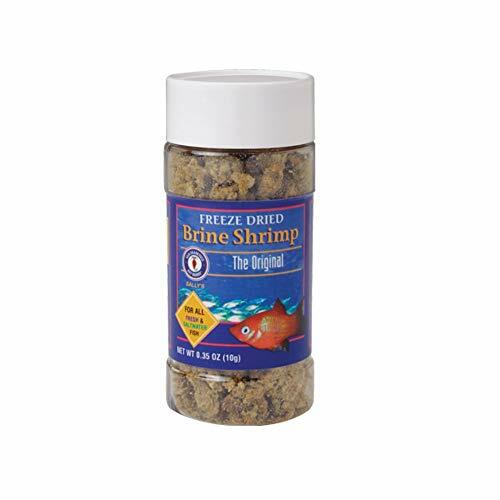 We believe this to be the second best food for betta fish, particularly freeze dried brine shrimp. 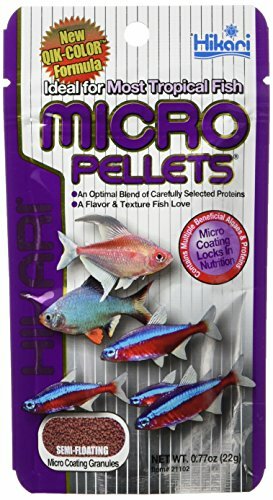 These are pellets of food, specially formulated to match the dietary requirements of betta fish. Easy to store and lasts a very long time. Easy to use – just sprinkle a few in your tank. Can be a great food option to vary their diet if normally fed other things. Fussier fish may avoid this because of its basic taste when compared to the previously mentioned 2 options. Can be more expensive than ‘generic pellets’ – you seem to pay more for the ‘specially for bettas’ tag. You can’t solely rely on this food – You MUST introduce variety into your betta’s diet every now and then to promote the best health. Although not the best option (for that, see the two foods above), specialty betta pellets do an OK job, are readily available, easy to feed and hard for a beginner aquarist to get wrong. Bettas absolutely love them – Perfect to buy as the occasional tasty treat! A fantastic source of both fiber and protein. They enrich your bettas environment, having to chase down and catch live prey like in the wild. Readily available and easy to source from your LFS. Being ‘all natural’ they do not cause digestive problems. The most expensive of all foods we list in this article. Messy and take a bit of thought and effort to store and feed. Live brine are a fantastic food, and if they weren’t so costly and didn’t require more effort to store and feed as the previous foods described, they’d be higher in our list. However, betta love them and they are exceptionally good for them too. So source them now and then as a treat. 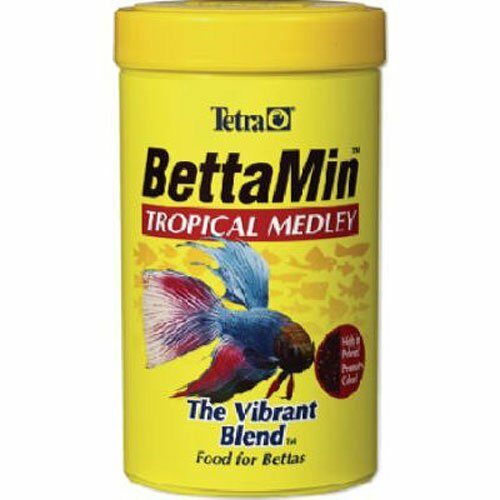 Following is a list of foods that if possible, you should avoid feeding your betta, even though some (mosquito larvae and live worms) are their absolute most favorite fodder in the world and exactly what they would eat in the wild. Mosquitoes live around and lay eggs in still water, the majority of which stagnant pools. And what do stagnant pools contain? A prolific amount of bacteria. Yes, locally sourced mosquito larvae are almost always riddled with disease causing bacteria, so in our opinion, it’s just not worth the risk to feed them to our betta. You can feed your betta live worms of many different varieties, with blood worms and brown worms being the most common. They are a favorite food source. Readily available at your local fish store. A natural food that will not lead to constipation or bloat. VERY messy, in fact THE messiest and smelliest of all foods to store and feed. Cannot be an only source of sustenance as they are too rich. All too often worms are riddled with bacteria and parasites so feeding live worms is like playing Russian Roulette with your betta – they WILL get ill eventually. Due to the very high incidence of fish coming down with disease and parasites after being fed live worms, we strongly suggest you avoid this food type. BUT, betta do love and thrive on them and they are an exceptionally good food. If you can find a good, CLEAN, reliable source, then go for it. Your betta will love you. But otherwise it’s risky so we don’t recommend them. 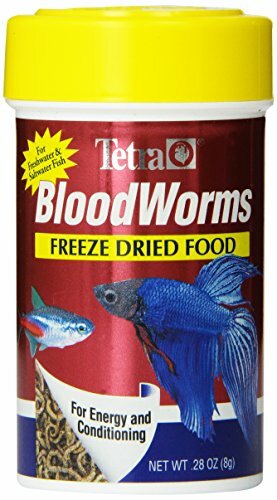 Many experienced keepers and breeders swear by them though, particularly bloodworms, so I guess it’s for you to decide. Flakes are a processed food full of cheap ‘bulking agents’ mixed in with vitamins, minerals and supposedly all a fish needs. Easy to store and feed – Sprinkle in the tank and you’re done. Zero risk of parasitic and bacterial infections when compared to live / frozen live food. Often contain added vitamins and trace minerals. They lack enough protein to be considered a good food for betta. They have a short shelf life once opened. Another affordable option for fish, coming in at a very low cost. Very easy to store and feed – Simply sprinkle in its tank or bowl. No risk of carrying bacteria or parasites into your tank. Often fortified with vitamins and minerals. Pellets are dry food and when mixed with water in your betta’s gut, they swell in size and cause bloating. Live mosquito larvae and live worms, although food your betta will love and would be eating in the wild, carry some very real risk of introducing diseases into your tank. For these reasons, we do not recommend the casual fish keeper to feed them…unless you have a very reliably clean, bacteria and disease free source. Fish food pellets and flakes just have too many cons outweighing the pros, are full of cheap, nutritionally empty fillers and lack the protein a betta needs in their diet. Also, most don’t even see them as food and swim away hungry. They really shouldn’t be part of their diet. Frozen live, and freeze dried food, are our recommendations for feeding your betta. Your fish will love them, they are safer and less messy than actual live food, and they are quite safe and disease free. However, if feeding frozen live worms, doing the tank with preventative anti-whitespot is wise, there are such meds can be used all the time without causing any detriment to your fish or any other tank residents. Finally, if you cannot find or afford frozen live or freeze-dried food, ‘Specialty betta pellets’ are the next best thing and your fish will do OK on them. Luckily, there are some almost universally agreed guidelines for how often to feed your betta, so this is easy for all to get right! Adult betta fish need to be fed once per day, while younger specimen require feeding twice a day. Please don’t just feed them now and then, when you happen to remember. Like all animals, daily feeding is essential, and if fed at the same time every day, their bodies adjust to the rhythm and that’s when they’ll do best and thrive. Again, the guidelines for how much to feed your betta are universally agreed, so this is another aspect of feeding that is easy for us all to get right. You should feed them only as much as they can eat in 2 or 3 minutes. This is because they only have a stomach about the size of their eyeball, making it very easy for them to overeat – Which if they can, they almost certainly will! This is important because it’s the easiest way to prevent your betta from over-eating. The other way is to carefully measure out exact portion sizes. However, it’s far easier to feed a little over what they need and then simply remove uneaten food after 2 to 3 minutes. Doing so not only avoids overeating, but also stops food from rotting in your tank and polluting the water, keeping the water quality higher for longer. Maybe surprisingly, it’s actually beneficial for your betta to skip a meal every now and then. As with many other fish (and indeed animals), skipping a meal occasionally will allow your betta’s system to ‘clean itself out’, allowing their digestive system to have a rest and help it to work much better on the days they do feed. So pick one day of the week where you don’t feed your fish. Maybe every Saturday, or every Monday. Making it the same day every week will make it routine and harder for you to forget. This is a simple and easy to execute way of helping their digestive systems stay in good shape, lowering the chances of constipation and bloat. A popular misconception surrounding betta is that they can supposedly last for many days without food and still remain in perfect health. Although it would take around two weeks (or more) for a healthy, well-fed betta to go from happy to starving to death, withholding food for days is certainly not a method that any owner should try. Why? Because it’s cruel and will severely affect the health of your fish – if not kill it. Bettas should not go any longer than a 3 day period without being fed. If you’re going away for a long weekend, your betta will be absolutely fine not being fed during your short break. Similarly, an office-based fish won’t be affected when left without food over the weekend, especially if the fish is consistently fed for those other 5 days of the week. However, if you won’t be able to tend to your betta for longer than a 3-day period, it’s recommended that you either ask someone else to pop into your home to feed them while you’re gone, or that you make use of an automatic fish feeder. Digestive blockages – Potentially fatal! Swim Bladder Disorder (SBD), particularly in double-tailed varieties. But as explained by PetEducation.com , overfeeding indirectly leads to other problems in your tank such as cloudy water, algae blooms, lower oxygen levels and more. Anyway, betta are extremely sensitive to overfeeding when compared to other breeds of fish. Like most fish, however, they will often eat as much as you will give them. They will not stop, just eat and eat, often until they die. Therefore, it’s important that you correctly follow the feeding guidelines given above. I’m sure you’ve seen or at least heard of the ‘Betta-In-A-Jar’ kits? They claim that the fish and plant are able to live in a symbiotic relationship, with the betta feeding off the plant full-time and the fishes waste providing nutrients for the plant. All they need is one-another for a perfectly balanced life. Well to sum up these claims: Complete and utter rubbish! They WILL live in these jars, Yes. They will survive a short time and then die after a short and unhappy life. Bettas are primarily carnivores. Naturally, when they’re living in the wild, they eat almost exclusively meat – insects, larvae and worms. They need a diet high in protein simply to survive. A betta would never choose to eat plant roots unless they were so desperate for food, getting close to death, that it was the only choice available. A betta should never be forced to try and live off vegetation alone! Please do not believe these claims that they can live off the plant roots. Betta are beautiful fish to look at, they make great pets and can live for years when cared for correctly. To do so, it’s important to feed them as close as possible to their natural diet. This includes food high in protein and fiber such as: Mosquito larva, live brine shrimp, live worms, freeze dried or frozen live food and pellets specifically designed for bettas. Young betta need to be fed twice a day, whereas adults only need feeding once per day. Only feed them as much as they can eat in 2 to 3 minutes, then remove any uneaten food to prevent overfeeding or polluting your aquarium. Bettas benefit from skipping a meal every now and then to clean out their digestive system, but you shouldn’t leave them without food for longer than 3 days. I haven’t, no. I see you run TFCG, is this something you have first hand experience of? Would love to hear your thoughts on it, do you have a link to where it’s discussed? Hey there, yes that’s my site alright. Nothing I’ve tried out first hand but I’ve read about it and watched a video or two. It seems that it helps fish who are picky eaters – so betta fish fall into that category. I believe Seachem makes a product as well. Anyways, if you like feel free to get in touch if you ever want to swap a guest post or two. Love the design of your site and pictures great work. Yes, I’ll hit you up in a short while, am interested for sure.